The best bourbon burger around. For gluten free - omit the bun and wrap in lettuce leaves, or stack on a plate and eat with a fork. You'll want to get every drop of the sauce. 1. Preheat your grill to 400°, or can cook in a heavy frying pan. 2. In a large bowl, combine the meat, bourbon, garlic powder, salt and Worcestershire sauce. 3. Mix using your hands. Form 4 patties, and indent the centers using your thumb. Place the patties on a well-oiled grilled, and cook for 15 minutes or until done. 4. In a large sauté pan over medium heat, melt the butter. Stir in the onions, and cook until tender. While the onions and the patties are cooking, get the ingredients for the bourbon sauce ready. 5. To a small sauce pan over low-medium heat, add all the ingredients for the bourbon sauce. Cook for 8 to 10 minutes, stirring occasionally, and then remove from heat. 6. 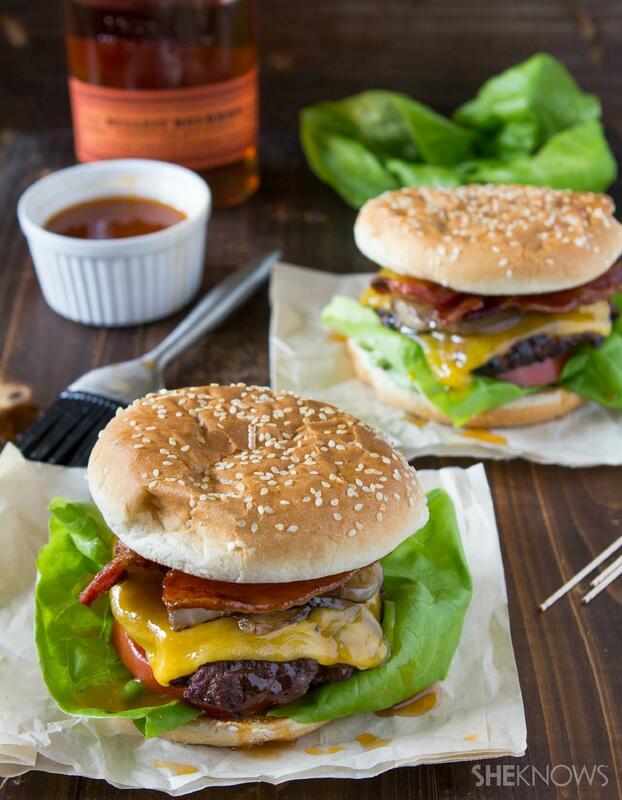 To make the burgers, layer the bottom bun with lettuce, tomato, patty, cheese, onions, bacon, bourbon sauce and then the top of the bun.